Mercy Funk, an Edmonton based band, was formed from an impulsively sown seed by bassist, Angela Proulx, who in her early teen years experienced what she calls a “funk revelation.” Upon the discovery of this infectious music, she set out to form a band centred around the likes of Parliament Funkadelic style hooks and mid-tempo slimey bass lines. The bands vocalist, Crystal Eyo, met Proulx through a few degrees of separation while mentioning to a coworker that she’d always dreamed of fronting a band of her own. Eyo grew up stealing the spotlight in various performances, clearly standing out as somebody who marched to the beat of her own drum. The evolution of Eyo’s vocal style has been influenced by her appreciation of wholesome Cat Stevens and the ultra sassy TLC. Baby Proulx, and business-professional Eyo would certainly not have crossed paths without the direct setup, and the reason they stuck it out can simply be credited to their shared extraordinary ambition. These women had nothing to lose, and everything to gain; and so Mercy Funk began. Mercy Funk released their first full length album Feel Good just in time to be your summer soundtrack of 2018. Since their sold out release party in June, the album has been travelling the airwaves of local radio stations and gracing the ears of an incredibly diverse fanbase. The members of Mercy Funk are pleased but not surprised that their songs reach grandparents, babies, and partiers alike. Feel Good is the eagerly anticipated follow-up to Mercy Funks self titled 2016 debut, where their reputation for selling-out shows began. The final track on the EP, Hey!, was written by Eyo at a party on a tambourine and it earned the group an Edmonton Music Award nomination for R&B/Soul Recording of the year. There were many steps between Proulx and Eyo’s team formation and the release of their recording projects. The ladies, as well as rotating members of Mercy Funk, could be found every Thursday night in the dingy basement of The Brixx jamming new tunes, or testing out their most recent rendition of their first original collaboration, Everyday. Nights religiously spent at this open stage connected them with current members of the band. 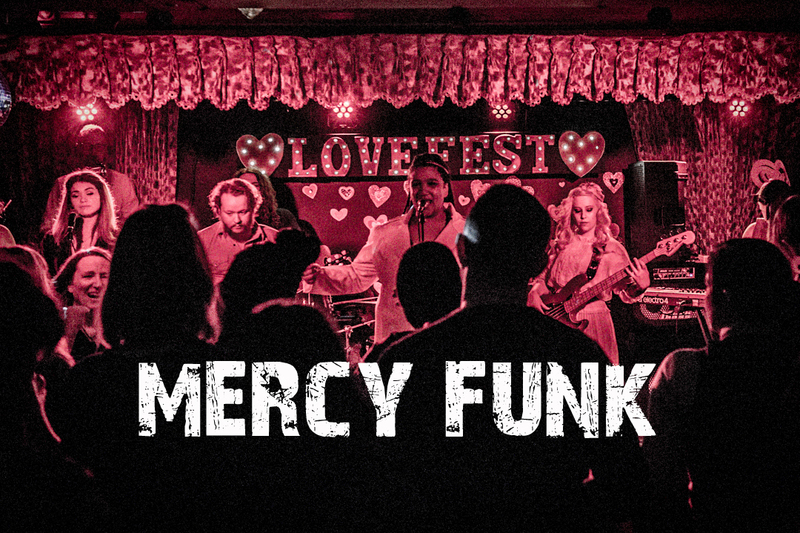 Allan Pangburn’s first official show with Mercy Funk was on Valentine’s Day of 2014 and the show was such a success that the band has since created an annual event called “Love Fest” to commemorate the euphoric energy born that night. Pangburn’s gentle tone is reminiscent of the sweet sounds from Muscle Shoals and his style leaves no room for ego, as he plays nothing more than exactly what is needed. Kevin Gaudet was holding down the drums for recording and touring metal band, Mortillery when he first met the ladies. Although their playing styles appeared to be drastically different, Gaudet’s adaptability allowed for a strong musical relationship to be formed naturally with members of Mercy Funk. Biography sourced from the band’s official website at www.mercyfunk.com.